Now that I have a definite deadline I can make a plan. Since there are so many of these available online and in print, it doesn’t make much sense for me to try to cook my own up. No need to reinvent the wheel. However, the assumption (oh yes I used that word) of most or all of these is that the test-taker is new to LSAT material. This means that these schedules are created with the first several weeks introducing the user to the World of the LSAT: How to do the games, how to read the logical reasoning, the different types of questions and how to attack them, the mindset and assumptions of the logical reasoning question authors, and other things you need to know if you’re going to stand a fighting chance on this thing. I’m not one of those. I’ve read the books and the blogs and the essays and watched the videos. I’ve heard pretty much all of it, so I don’t need to spend weeks studying up on it, taking the time again as though this is my first time seeing it. So far my best score is 171, untimed, so I am getting a lot of it. I just need reminders. These things, my months of studying already and the fact that it is at least to some degree working, mean that the pre-made schedules aren’t going to be quite right for my needs. They will work as a great starting place and way to figure out how to organize my time and practice. Most of them seem to want you to study hard on a single thing for a few days or a week, with small pieces of the other sections spattered in there so you don’t forget those things while you’re intensely looking at the other. For example, many will have you doing only one type of logic game for several days, but to make sure you don’t lose what you’ve learned about the other things, to do a few of each type of logical reasoning and a couple reading comprehension passages. That seems like it should work for me, so I’m going to give it a try. There are obstacles to this for me, things that make my schedule erratic and difficult to even really call a “schedule,” such as my kids, work, home, family, and husband, most of which I did not have five or more years ago (the age of most test-takers and the age group for whom many of the schedules are developed). So it’s going to take some doing. I think it’s going to be worth it. At least it better be. It’s going to cost me around $100 in books by the time I’m done, and the test itself is $175, a lot of money for me. On another note, I finished Grey’s a long time ago, then finished Scandal, and have moved on to Supernatural. This is yet another show people have been telling me to watch for years and I don’t know why I held out. It’s good. Even if it is scary and I generally don’t care for scary, I can handle this one. How to Master LSAT Logical Reasoning Necessary Assumption Questions by Lawschooli. Watch for leaps between cause and effect. Does the stated cause necessarily or only cause the effect? Still watching Grey’s, now into the ninth season just after the plane crash. They brought in this new herd of interns probably hoping to keep the series going smoothly with a new cast, probably what ER did, but I don’t think it works. I just really do not care about these new characters. They’re for the most part not compelling or interesting. I just finished Matt McCarthy’s “The Real Doctor Will See You Now” and I loved it. I felt there could have been more to tell about that year of training and living that got buried in trying to keep a narrative going. I understand that personal nonfiction requires an ongoing story in order to make it readable, but in this case it overwhelmed the general idea. At least I thought so. I bought another new book, this one the most recent book of 10 LSATs available, and I plan to start doing those sometime this coming week. I have two games and the three other sections left to go in the last test of my old book of old tests first. My LSAT progress is still disappointing. I’m averaging low 160s still, so I’m plateaued and it’s frustrating as hell. I just want my scores to improve already! I’m consistently scoring 95% or better on the reading comprehension and logic games parts, but the analytical reasoning just isn’t good enough. I’m still reviewing my Logic Games Bible and reading other things online as I come across them and reading answer explanations on Manhattan Prep for each question, but so far it’s not quite good enough. I’m not sure if I need to do more and if I keep doing it, it will eventually just click and sink in, or if I need to go another route. Advice? I’ve spent the last two weeks trapped inside and it’s making me a little nuts. I was sick for the whole week two weeks ago with headaches, exhaustion, and light sensitivity, so even though the weather was great, the kids and I were stuck inside. For this past week it’s been over 90 by noon every day with a bazillion percent humidity, so we’ve been outside all morning until naptime, then trapped in here all afternoon and evening. Only three weeks til our big trip! and I turn thirty… Excited to go be somewhere new with little responsibility and to have the kids spend some time with their grandparents, who are coming to the house to watch them. I have to keep reminding myself this over and over and over and over…. Just because I missed one I felt certain was correct does not mean I am stupid. It means I need to review that concept to figure out what I misunderstood and use the new information to do better next time. Just because I missed some that the answer helper sites say are “easy” does not mean I am stupid. It means my strengths lay elsewhere and I have found something new to work on. I finished preptest 10 today and it was a disaster. High-150s disaster. By the time I finished the test and tallied my raw score, though, I knew it wasn’t going to be pretty. I was missing way too many questions in a row in each section for it to be a good thing and I suspected the final result would be disappointing. I was right. I’ve decided to celebrate the peaks (the high scores) and use the valleys (the low scores) to highlight what I need to work on. Nothing else. The valleys are not worth worrying about and so far are just anomalies. The peaks are very good and I am choosing to focus on the fact that those are even possible for me and use them as something to strive for. The important thing with my high scores is that I hold onto them as something that I am capable of, and compare me only to myself, not to others. I’ve moved on. As soon as I finished that test I moved on to the next one. I know what I did wrong on the last one, which was keep too close of an eye on how well it was going, so that by the time I was about halfway through I knew that it was no longer possible for me to get a score anywhere near what I wanted. So I more or less stopped trying. I just could not force myself to dig into the questions and care the way I needed to. I did still approach them a few at a time and go over the ones I got wrong kinda carefully so I could attempt to learn from them, but I wasn’t doing enough. I still needed to finish it for the practice, even if it wasn’t good practice, though, so I finished even though the test’s value was diminished. For this next one, I’m going more slowly. Even though I find it difficult to check my answers one at a time because I can always get a slight glance at the correct next answer down and have that affect how I process the next questions, I’m going to do that for these (except the logic games, because those should be graded as a whole, as far as I can tell). I’ve done about a dozen logical reasoning questions of this test. I’m going through them more deliberately than I have any others before. I’m taking them one at a time, some of them one word at a time, and digging into the content and question type as well as I can. For each question I’m going back to my book and notes to review how to do it before I answer. Once I’ve answered, I check it, then even if I got it right, I go find the question HERE, and if I still need more, compare that back to the book again. The method is slow and tedious, but so far I like to think it’s working. What will ultimately show if it works is how well both this test and the next one turn out. One of the friends I contacted about my pursuits said that one of the hardest parts of the LSAT was the mental endurance. It’s hard to sustain that kind of focus and intensity for hours, especially when the weight of the outcome is so significant. I haven’t even gotten to that problem yet. I’m finding that I can barely focus on reading the logical reasoning text or doing a game for more than a few minutes or sentences at a time. This is not good, not just for LSAT purposes, but in general, so I’ve decided to fix it. 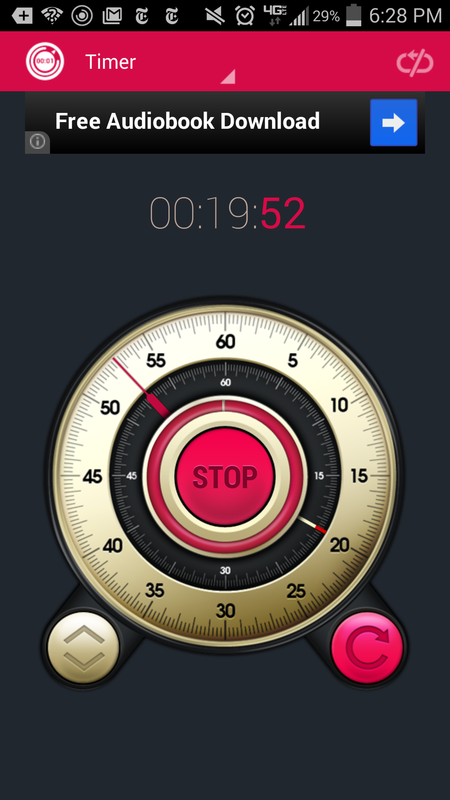 Now I use a timer, a free app on my phone (see picture above). I set a timer for 20-30 minutes and read nonstop during that time. I fight all urges to look around, skip ahead in the book, check the time, look at my phone, or think about anything else at all. These 20-30 minutes have already been set aside for this one thing and nothing else matters during this time; nothing else is as important or allowed to intrude. After some reading or studying time I give myself time to do something else, usually read whatever book I’m reading (currently Sonia Sotomayor’s memoir), facebook, pinterest, or lawschoolnumbers.com. I get these breaks and indulgences for exactly 20 minutes, and then it’s time to study some more. I’m planning to increase the time on work and decrease the treats as time passes, slowly working toward full, timed preptests by the end of summer. For now, I only time the logical reasoning reading and my “free” time, but not the practice logic “games,” which I still try to do daily. I’m not ready for those to be under time constraint yet; I need to be good at doing them period before I try to get good at doing them fast. Hopefully I’ll be ready in time. I’ve been doing it for about a week and it seems to be working. At first I had a hard time ceding control to the timer and trusting it, but I’m slowly giving over to it. I think I was afraid that I’d get too involved in studying and too much time would pass. The library would close and I’d be stranded in the middle of a difficult section, forcing me to start the whole section over again next time because there’s no way I’d adequately remember or understand the section doing it piecemeal. But I always make sure that I have plenty of time, so I’m learning to let go. So that’s my new strategy, my new discipline. I hope it works not just for the LSAT, but for school, work, and other things in general. I have two kids, ages two and almost-one, and they think it is hilarious when little things and big things go together. For example, they cannot get over how funny it is when an adult wears a tiny baby hat. They laugh til they fall over. We have a former booster chair that is now just a chair. It is a small chair and I am a full-grown adult. I think you can see where this is going. I was sitting on the floor with them when suddenly my older son pointed at the chair, pointed at me, and said, “Mama sit! Mama sit!” His little brother soon joined in. The idea of the impeding humor was so great for him that even though he isn’t quite one yet and doesn’t even know the words, he was able to mimic his older brother. Soon they were chanting and giggling together. So, to humor them, because there is little greater than making babies laugh, I decided to sit in the chair. 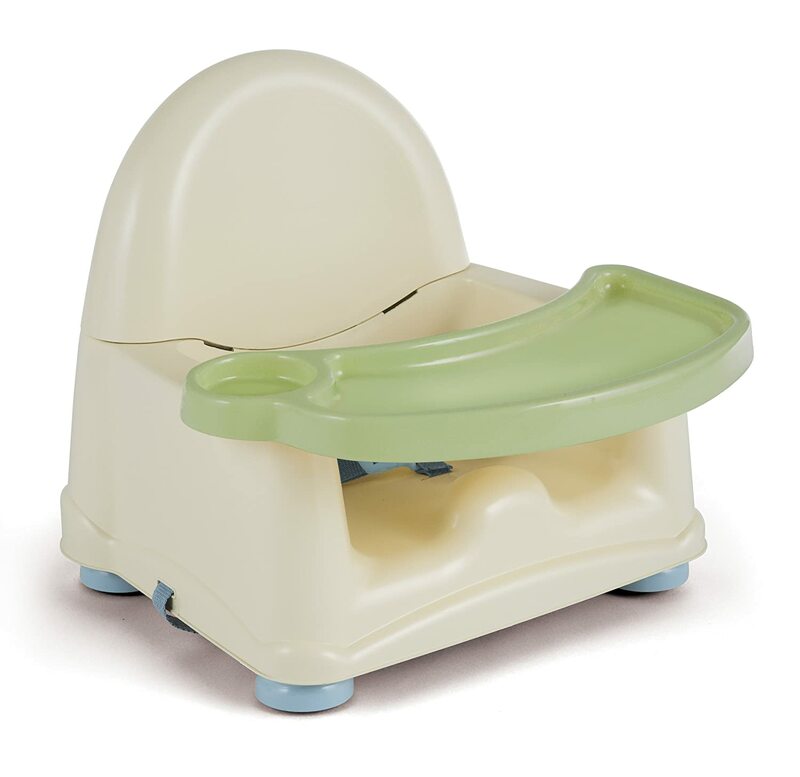 This is the type of booster seat that has a leg-divider thing in the front of it. I’m not totally sure what the point of this mound of plastic is, but it’s on most little kid seats. I lowered myself slowly, slowly, into the chair…. exactly wrong. Suddenly, PAIN. I could feel the pinch in the back of my throat from the pain shooting up my backside and I could barely move. I had to tip myself slowly sideways and lay down on the floor on my hip because my tailbone hurt so bad. The kids were laughing so hard they’d both fallen over by this point. Odds are good the younger one peed his diaper. There were tears in all of our eyes. Turns out there isn’t much you can do for an injured tailbone other than ice, Tylenol, and take it easy. It also turns out that hurting your tailbone can have some unexpected consequences. Among these are having to watch “Happy Feet” twice a day for a week because I can’t sit on the floor and play with the kids and can’t take them outside to play because I can’t bend and run and do all the things necessary to keep them safe. So “Happy Feet” it is, on a loop, with a little “Top Gear” thrown in to change things up once in a while. They play fine by themselves, too, I make sure of that, but the time when they should be playing with me got swapped out for the TV. I feel guilty, but I think I’d feel more guilty prolonging the injury or risking their safety. Another unexpected side effect of taking seating advice from giggling babies is the challenge it adds to studying. This is where this ridiculous story gets back around to the theme of this site. It’s been a week since I hurt my tailbone and it still hurts to sit. For the first two or three days I couldn’t sit at all; I had to lean or stand. Even today at the library I had to constantly shift my weight. I can sit better now as long as I lean forward a bit and keep my weight off my tailbone, but not for long, and the constant shuffling makes it difficult to focus. Fortunately, I go to the chiropractor tomorrow and I’ve heard they can fix this. I really hope so. I was getting good at the “games,” and after a week off they were a disaster. Before hurting myself I was missing only one or two per “game.” Tonight was such a disaster I had to quit several times because I was getting so frustrated. The best I did tonight was getting one or two right per “game.” I reached a point where, between frustration with failure and being distracted by the book I’m reading, I had to set a timer. Twenty minutes of reading, do a “game,” twenty minutes of reading, thirty minutes reading about “games”….. It worked, well enough at least. I was able to get enough novel reading done to satisfy myself to refocus on studying and I was able to get through the grouping games chapter of the book. The next chapter is on “games” that are linear and grouping, and since I don’t feel I have a good enough grasp on those two independently to combine them yet, I’ve started over at chapter 2. The second time through the first several chapters should go more quickly and be more fruitful. Anyway, the moral of the story is Do not take seating advice from giggling babies. I’ve already gone over why I study at the library: To minimize distraction. Part of being a mother, for me, is that I am alert to sounds of my kids’ distress whether I like it or not, whether I need to be or not. Even with my husband caring for them, I can’t tune out their sounds. So I go to the library. But. I knew that the library itself would be a distraction. I like books, I love reading, and I always have. I have my master’s in library and information science for crying out loud. Books and ideas are a love apparently similar to what I have for my children, or at least nearly equally distracting. This means that being surrounded by books, especially nonfiction, which is what the study carrels are next to at my local library, is a distraction. I tried not let the shelves get to me, but it didn’t work. As I plodded through page after challenging page of lesson and practice in my book, I couldn’t stop thinking about what might be on those shelves. Since we’ve only lived in our house a little over two years and with new items being added regularly, there’s no way I’ve read through even a tiny portion of what’s there. I can’t keep my mind off the possibilities. I suppose with time and effort I could train myself to focus and let go of the temptation to wander, but I don’t want to. Just as I don’t want to train myself to be indifferent to the cries of my children in any context (though compartmentalizing this may be a healthy thing to do, I don’t know), I don’t want to become immune to the cries of books. The desire to respond to these things, to care for my children and to pursue new ideas and perspectives, are good and healthy things. I should be tempted by new information and a broadened worldview, by the expansion of compassion and empathy that should naturally grow from exposure to new information. Maybe I’m just poetically justifying a distraction, or maybe what I’m saying here is legitimate, I don’t know. 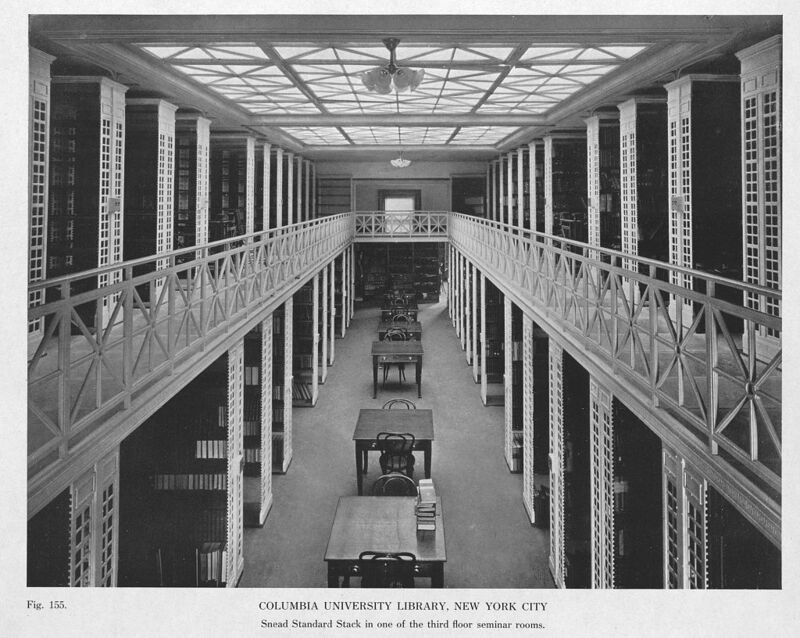 But I do know that for today it holds true for me, so when I’m not currently in the midst of a book, I wander the stacks before I sit down to study. I walk up and down the aisles until I’ve found something new or something old I just need to experience again, and I check it out. Once the book is checked out to me and in my bag, I can sit down and focus on today’s work. My mom was in town for a professional conference last week, so we decided to meet for dinner when she’d finished all her sessions one day. Since I got to my mom’s hotel about half an hour before mom finished her last session, I got brave and walked a couple blocks to one of the three local law schools. It’s located near downtown, which is a little scary for me inasmuch as I’m terrible at driving in that area, but the pretty building and nice landscaping made it more acceptable. It is immediately noticeable that the campus tries to set itself apart from its urban surroundings. Whereas the rest of the neighborhood is (or at least seems to be) concrete and glass, the school has neatly manicured lawns and pretty gardening (as much as this can really be seen in March) .The green areas come off as though they’re trying a little too hard to be pretty to compensate for their scarcity, though they do help add a bit of charm to the otherwise grey environment of the campus. Standing outside the building, I was intimidated. It’s nowhere near a top school (ranked nearly 150th), but it has the air of small-scale prestige. A large glass front, while not seeming to be the front because it more or less faces the center of campus and not a street, gives a sense of modernity, which is tempered by beige stone that softens the appearance a bit. Still, it’s intimidating. I stood in front of the doors for a few moments debating whether to run away, checking my clock every few seconds, hoping that I couldn’t go in because time wouldn’t let me and I’d need to get back to Mom’s hotel. No such luck. There was plenty of time and the doors were unlocked. So I walked in, pretending that I’m the sort of super awesome person who would never spit gum into a lawn or onto a sidewalk and so just needed the nearest trashcan to spit my old gum into and what do you know?! I just happened to be near the law school, so I’ll wander in here to spit out my gum, not to check out the place and risk being seen by someone who may question my presence. I’m just not ready to answer that question in person (I rambled horribly the first time I was asked in person and even worse when asked online). I’m not prepared to risk being taken on a tour or to meet people who could decide my future. I feel like there’s a risk that someone I meet on campus could remember me (how?! I don’t know) when/if my application comes through and recall what a bumbling fool I was when I was creeping around campus. I looked around to make sure there was no one around, saw a custodian who didn’t seem to care I was there, then spit out my gum in a trashcan by the door. I was there long enough before quickly walking out to see what I think was the back of the library and the front doors of the moot court room. I have been very comfortable with public speaking since I started waitressing when I was 16 and then worked in classrooms for the next ten years. I have no fear of speaking in front of crowds, but that room could make me throw up. I didn’t even go in it. The doors were locked (I assume) and the lights were off, but I was intimidated. Very intimidated, and I’m not even sure why. The thought that I could be graded on how well I can think and speak in that space is frightening, but with a few years to contemplate it and most of a year/semester(?) to actually work on it, I’m sure I could be fine. I got the feeling in my few moments on this campus that while it’s not prestigious, it is a place where I could succeed, even if its low rank means some of my goals might be harder to meet. This local school was small but imposing, and everything I expected in the first-step-on-campus experience of a law school. I’ve read and worked through most of the first real chapter of the Logic Games Bible (chapter 3, the first two are more introductory (though definitely recommended reading)), and now that I’m only a few pages from the final exercises of the chapter I’m excited. I looked ahead a few pages yesterday afternoon while I was reading and saw that the end of the chapter is several pages of “games” and their solutions and instead of fear and dread, I felt excitement. I know I won’t be able to answer all or even most of the questions and that most of them I do answer will probably be very wrong, but I can approach it with a little more calm now. I’m eager to try this time, to test what I’ve learned and see if I’ve actually learned anything. I want to conquer the “games” and my own stupidity. When I did email her back, I think I got in most of the ideas, thought processes, and reasons for pursuing this, but they came out so jumbled and rambling I’m not sure I did myself any favors. We’ll see. She hasn’t gotten back to me yet. Though, honestly, I don’t know how I’d respond to someone who sent me what I sent her.